Finally the tickets were booked for the trip from Bangalore to North East India; which in-effect acts as a commitment to the trip and the start of the actual preparations. A plan for a few days of exploration trip on a high level was laid out few months back, but would only be taken seriously only now. The Inception of this trip was during the Rainy season, where we had narrowed down for a short trip to Northern India. More specifically, Tawang. With the passage of time, this short trip somehow got translated into 12 days trip, and as a consequence, the toughest part of the readiness ended up getting permissions from our better half's. When put on paper, we realized that, we are going to cover 3 states and touch 3 Countries (at the border only). We didn't intend to book and mark the places to the T, where we would be each day , but we intended to keep it dynamic. Only for the first couple of days, we booked the Resort in Kaziranga and also the Jeep Safari's. ( We are kind of against the Elephant Safaris). Here is the high level plan which we had chalked out - and I have to admit, we kind of ended up following this quite well. Bit of changes, as you would understand, from the blog. 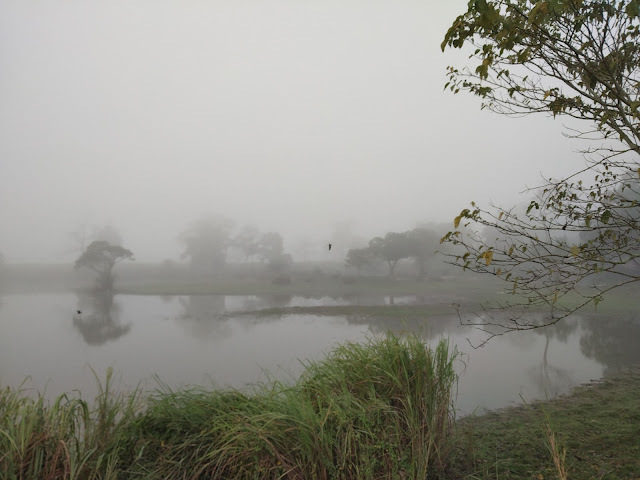 Day 1 - We had to catch the flight at 7 am from Bangalore , and were supposed to reach Guwahati, Assam by 10:15 am and as for the the rest of the day, we planned to drive down to Kaziranga and also buy some supplies for the trip on the way. One SMS from the airline on the previous day, indicated that the flight has been delayed by 7 hours and will now depart at 2 pm. That was the first set back, but on a positive note, that also meant that we could have a good sleep before we leave in the morning. In hind sight , whatever happens, is for the best. The next day, we three, Vijay, Prasanna and me boarded the flight at the KIAL airport, Bangalore at 2 pm and landed in Guwahati at 5:30 pm, only to find that, its very dark at this hour. We found our cab, a Mahindra Xylo, which was already booked, and the driver, who didn't quite look up to the mark, helped us to get our luggage inside and headed for Kaziranga. Day 2 - The day started early, with sunrise here , earlier than in Bangalore. We didn't need the alarm to wake us up. All the folks from the neighboring rooms, made all the noise enough to wake us up and the early morning sunlight had lit up our entire room. We quickly got ready for the first Jeep Safari, and got all our camera gear , trigger ready. Though the Jeep arrived a little late, we managed to reach on time. The first Safari was in the Central Zone of the Kaziranga National Park. This is around 2 kms from the place where we were put up, ie Kohra. Most of the resorts are in this area only. The first spotting which we had was this wild Elephant. It was a treat to see at such the huge animal at such a short distance. So, this was all that, we had to be satisfied with, in the morning safari. But to summarize, the highlight of the morning safari was the fog in the national park, and the drive through it. The 2nd Safari of the day, was in the Western Zone , which is called the Bagori Zone. Since we hadn't managed to have a decent breakfast, we quickly managed to gobble up a quick lunch at the neighboring resort. The food was sumptuous and tasty, and at the same time, quite simple. Rice, Dal , Roti's and couple of Veggies. Though it was afternoon, there was still a chill in the air and I was simply loving it. The drive to Bagori Zone was not as quick as Central Zone. It must have been close to 15 minute drive. The views on the road were really pretty, and we hadn't manage to see it the previous night, while coming from Guwahati. Just as the Maruti Gypsy rolled into the park, we had a close view of one Rhino. We were able to see very clearly with our naked eyes. As we moved ahead, we only realized that, there would be many more Rhinos which we would see. Now if this was close enough, what we saw next was even something unbelievable. And now, I really don't want to make a long story short. It will be a long story. The picture below, is of the Safari Jeep, which was ahead of us. Little did we know at that time, that, this Jeep standing there, would be instrumental in making life long memory of this Kaziranga Safari. Hence its imperative to have a classic shot of this Jeep. Anupam, the Photographer on this jeep, just stopped the jeep in the middle of the road. They signaled to us to stop. We are just behind them, and we took this picture of the jeep( Just to give the idea, of where we are ). They could see a Rhino, which was just about to cross the trail. We patiently waited. And waited. A few minutes turned into 15 minutes, just standing still in our jeep. We had no line of sight of what the Rhino is doing. Only Anupam and his team could see. The jeeps coming from the opposite direction were also made to stop. Soon there was a huge pile up of these Vehicles, but Anupam was not ready to give up. Our Guide and Driver told us, finally after some 25 minutes, that, if the Rhino hasn't crossed till now, there is almost no chance it would cross now. We had crossed our threshold limit of waiting in there. Finally were started the engine of the jeep.. and what!!! The Rhino just starts to come onto the Road. WOW!!! That was all we could say. I am sure, Anupam and his friends had the same expression. The sweet sound of high speed shutter didn't seem to stop for quite some time. Kindly note the pile up of the Vehicles on the other side , in the interim. But then things were about to change. We knew that, for some nice reason that, the Rhino would move towards Anupam's Vehicle. After all, he did all the ground work. But then the unexpected happened and the Rhino turned towards us 😊. The cameras didn't get a break this time, and the continuous sound of the shutter, wouldn't have sounded any better. Though we initially we had completely zoomed out the lenses, his every step closer to us meant reducing the focus length of the lens, up until, we reached the minimum focal length and finally had to move the jeep in the reverse gear. Every moment, of this is still etched in our minds, including the background music of the shutter. At one point the majestic animal, was so close, that we had to stop shooting and spend those moments completely enjoying the view with our naked eyes. Now, those moments can never be captured or documented. They can only be remembered and the words here, might just help go back to that day and time. Sometimes, these pictures don't even make justice to what we see in the wild. While the Rhino, finally deciding to move into the bushes, we kept our camera's down and sat down, just wondering, what just happened. Finally, as it was starting to get dark, we managed to get one Mother and Child Picture. Not the best, but definitely one for the keeps. Kindly note the Rhino's in the background. For the evening we had tickets for the Assam Cultural Program, which was organised by the 'Kaziranga Orchid and Bio-Diversity Park. This program is held everyday and it costs Rs 200/- towards the entry fee. The show was incredible as we got to see the various dance forms from Assam and the other North East States. The play of the percussion instruments by the young people was simply mesmerising. Here are a few pictures, but they will not really make any justice to the actual program. You can check in Youtube for the dances and I am sure you will love them. With such variety of songs and dances,it was an evening to remember. Please make sure to visit this place during your trip to Kaziranga. 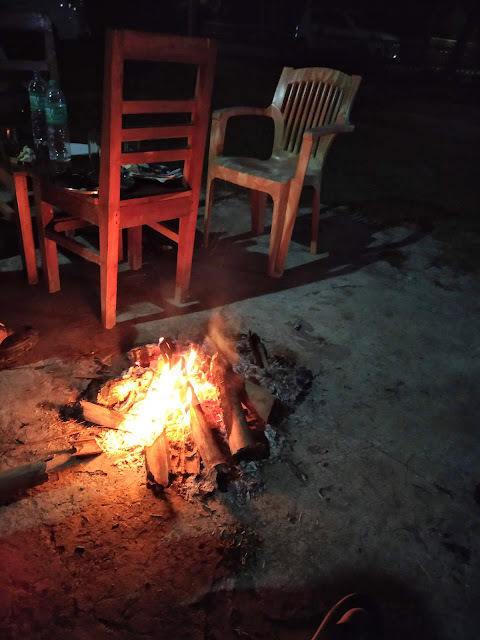 Once back to the resort, it was time to enjoy sitting next to the bonfire in the cold weather. It was a welcome relief. We enjoyed a nice tea, which we got from the shack outside the resort, it was really nice. It was probably the first time we really enjoyed the tea, after landing in Assam. There we met some other folks, who had come from West Bengal. The two guys were working in the Railways and we had some interesting discussions. Some of them were related to the changes in the Railways, in the past few years, mostly after the Modi Govt has come at the centre. They did mention that, it was a very welcome change and the ease of doing work is much much better. They do feel that, they are doing something better for the country, which didn't feel anytime before in their careers. It felt good to hear such comments from the people at the grass root level. After having a nice Assamese dinner, we retired for a well earned sleep. 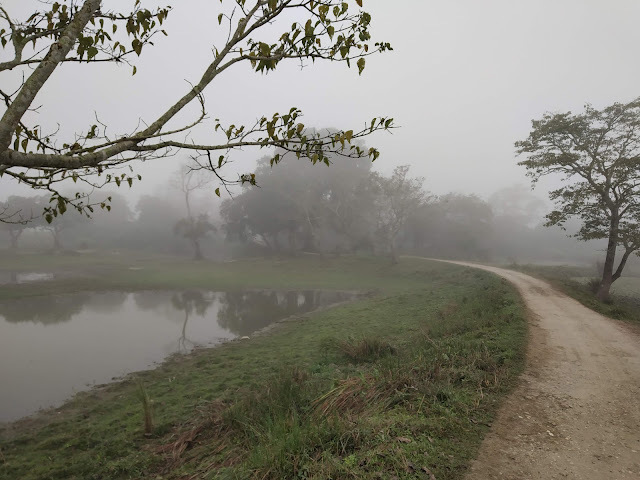 The 2nd day at Kaziranga, was earmarked for the Eastern Zone or better known as Agoratoli . The drive from our Resort, The Park, was significant. The cool breeze was blowing towards us and, with the hint of early morning sun, making the ride even more enjoyable. During the drive the camera's were at ease, and it was more of our eyes that did the view. We didn't know at that point of time, that, this would be the routine most part of our morning Safari. We had to drive through some villages and could see the paddy fields all yellow. There is something in this color, and having seeing these views during our childhood, makes the experience even more nostalgic. Once we got into the forest, it was peaceful. The camera's were trigger ready, but there was no trigger for the reflex to kick in. There was calmness all around. The chirping of the birds was something, which we hadn't experienced in this trip as much as we would have loved. But now there was time for that. That seemed to be the only excitement. We admired the flora this time , more than the fauna. The Wild Buffaloes seemed to be having a relaxed weekend kind of feeling. They didn't move a inch. But it was serene and pleasant. Just as we moved a bit we saw a herd of deer, and then gave a call. It signaled something. A signal of danger. All the deer's were suddenly on their feet and they started to run. The Birds too started fly suddenly. Something was different. We couldn't place our finger on anything as such. A deer's call, would normally indicate the coming of a Tiger or any animal, which could put their lives in danger. But they didn't run so frantically, which they should have done. The sudden movement of the birds, didn't make much sense too. The Tranquility of the place, made us feel a part of the Wild. Being armed with a Canon and a Nikon, we had to shoot something. We found the trails also interesting and aimed shoot at them. Did we really have much of a choice ? When we finally did see the Brahmaputra river, it brought some life back into us..
We were finally out of the Park and on the way back to the Resort, and seeing the Rice fields was a pleasant sight..
After a sumptuous lunch, we had to be ready for the 4th Safari of this trip. This was again at Bagori. We were all excited again, as we would have more options to see the Rhino's again. Now that we knew, about this side of the Park, we were quite choosy about the areas we wanted to. But for a change we decided to take our own pictures. At one point while waiting for a Rhino to cross, I could manage to take this picture of this beautiful bird taking off. And this is the last Rhino, which we found while we were rushing towards the exit..The light was very less and we had bumped up the ISO, but we still had a shake. Just a good ending to an otherwise very eventful Safari. Though ,The Law of Diminishing Marginal Utility was at work, we had better shots on the 2nd day at Bagori. It was eventful, unlike that of the morning session. It was lively and interesting. There was also a news of a Tiger crossing and most of the time was spent waiting for the Tiger, though we couldn't spot anyone. But the number of Rhino which we could see, was phenomenal. Sadly this came to an end and so was the stay at Kaziranga. A tip for those going to Kaziranga, if you are doing only One or Two safari's, make sure one of the them is for Bagori. Its no exception. This marks the end of the story for first 3 days of the trip. The remaining would be covered in subsequent blogs.